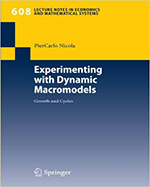 This book presents a macroeconomic dynamic model à la Solow-Swan, including the market for labor, in a discrete time structure. Labor supply is modeled as a reversed S curve (derived in the appendix). The models are expanded to include expenditure on R&D (thus endogenous technical progress), and public expenditure on infrastructures. For each of the three models, numerical simulations are implemented in MAPLE, and the results are shown in time series figures, which make it easy to detect that even small changes in the parameters produce responses in the time behavior of the main variables: from steady growth, to regular cycles, to chaotic-like time paths. The simulations show that cycles do not promote material welfare, as measured by total undiscounted consumption along the time horizon, and that the comparative action of R&D versus public expenditure is strictly linked to the values assigned to the parameters.